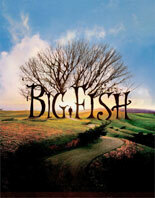 Big Fish (EE.UU., 2003). D.: Tim Burton. G: John August, basado en la novela homónima de David Wallace. P.: Richard D. Zanuck, Bruce Cohen y Dan Jinks F.: Philippe Rousselot. M.: Danny Elfman. Mo: Chris Lebenzon. I.: Ewan McGregor (Edward Bloom de joven), Albert Finney (Edward Bloom de anciano), Billy Crudup (Will Bloom), Marion Cotillard (Josephine), Jessica Lange (Sandra Bloom de anciana), Alison Lohman (Sandra Bloom de joven), Danny DeVito (Amos Calloway), Helena Bonham-Carter (Jenny/Bruja), Steve Buscemi (Nother Winslow). 125'.